Mark your calender, because we have another awesome line-up of events at the lake this summer! Canada Day Boat Parade and BBQ – Sunday, July 1st, 12:00 p.m.
Again PLCA will sponsor and organize this celebration of our country’s birthday. Decorated boats will meet at 12 p.m. between the two islands at the entrance to North Bay. The parade will end at the home of Mike and Donna Hale. All members will have food waiting for them provided by Carly&Shaun’s ‘Lakehouse On The Run’ Food Truck. . This is complementary for members and non-members will pay a nominal fee to help support the expense incurred by your association. Hales’ place is 1km south of the Lakehouse. Yellow raft out front if coming by boat. The docks will be identified for parking with balloons. 26785 Hwy 28 by car. Stay right to end of road. Don Thomas Memorial Rock Bass Derby – Saturday, July 7th, 9:00 a.m.
Paudash Lake Marina is again hosting this event for the PLCA. 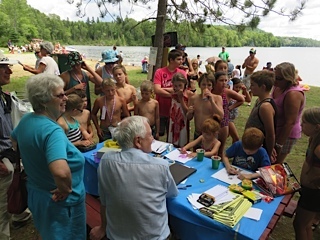 Youth age 2 – 18 can compete to remove the most rock bass from the lake and are awarded prizes and a certificate for helping protect Paudash Lake’s game fish. The Ontario Federation of Anglers and Hunters (OFAH) continue to support this event with a generous donation of many prizes. This is free for members and a small fee for non-members. PLCA Annual General Meeting (AGM) –Sunday, July 22nd, 10:00 a.m. Please come out and find out what your PLCA is doing and have input into your association’s future. An informative guest speaker will also be attending. The full agenda, location and guest speaker will be communicated by email later. Swim and kayak races, egg tossing, nail hammering, battle of the bays tug-a-rope, and many more fun and challenging events for both kids and adults. Our H.E. firefighters will have their BBQ and drinks on hand and a sunny day is all we can’t control. In the event of poor weather there will be NO RAIN DAY.